Is ConAgra Foods, Inc. Destined for Greatness? Packaged-food supplier ConAgra (CAG) has lagged behind the organic movement, but it's hardly standing still in this changing industry. Investors love stocks that consistently beat the Street without getting ahead of their fundamentals and risking a meltdown. The best stocks offer sustainable market-beating gains, with robust and improving financial metrics that support strong price growth. 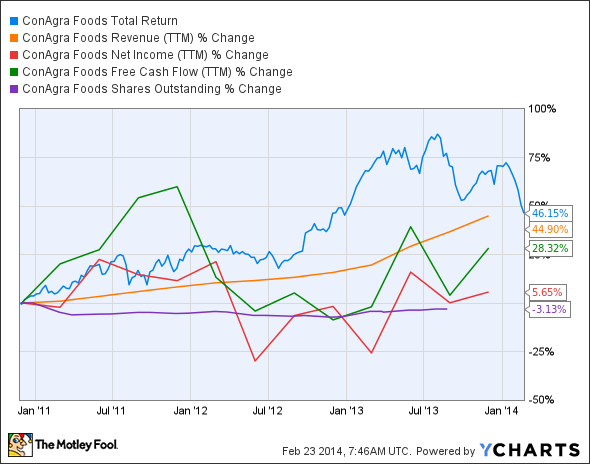 Does ConAgra Foods (NYSE:CAG) fit the bill? Let's look at what its recent results tell us about its potential for future gains. Packaged-food manufacturers, which are typically ConAgra's core customers, have lately struggled to maintain product volumes amid a growing demand for natural and organic foods. As a result, ConAgra reported lackluster revenue and earnings per share in its latest quarterly results. 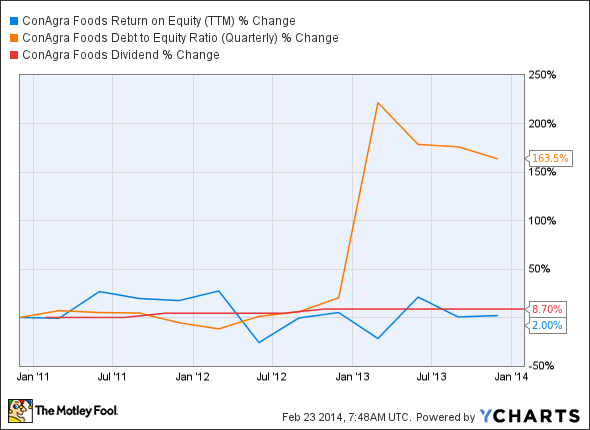 Fool contributor Dan Caplinger notes that the company's Ralcorp private-label business hasn't fared well either, due to a weak potato crop, but also because of changing market conditions in the grocery industry, resulting in lower-than-expected earnings guidance for the second half of ConAgra's 2014 fiscal year. ConAgra plans to shore up its deteriorating business performance through a wider advertising and marketing strategy. Moreover, the company has also introduced 23 new restaurant-quality frozen meals with the Bertolli and P.F. Chang brands, which should help meet the demand for higher-quality frozen meals at supermarkets. On the other hand, ConAgra's packaged-food rival Kellogg boasts a strong pipeline of Genetically Modified Organism (GMO)-free products for 2014, which will ratchet up competition between natural/organic foods and the industrial-food ConAgra represents. Of course, Kellogg is quite industrial in its own right, but consumer perception matters, and ConAgra can't afford to fall behind the curve. ConAgra continues to sign more lucrative private-label partnerships with grocery-store chains, which are turning toward private-label products to raise profit margins. However, food giant Nestle has begun making inroads into some of ConAgra's markets -- the Swiss-based company has rolled out a new line of frozen dinners and is heightening its focus on promoting frozen foods. This may wind up benefiting ConAgra by opening up a new supply line to a major manufacturer. The acquisition of H.J. Heinz has also given ConAgra a potential opportunity to provide ketchups to McDonald's, which would be a major windfall if it's worked out. Fool contributor Rich Duprey points out that ConAgra has faced multiple setbacks in the pursuit of a $4 billion flour mill merger with Horizon Milling -- a joint venture of Cargill and CHS -- which would create the largest flour company in the United States. The American Antitrust Institute and watchdog group Food & Water Watch have both raised concerns, noting that this level of consolidation in the flour market would depress prices obtained by farmers for wheat crops. ConAgra has proposed the sale of four of the mills now held by this new venture's current component companies in order to mollify critics. Today, ConAgra Foods has some of the qualities that make up a great stock, but no stock is truly perfect. Digging deeper can help you uncover the answers you need to make a great buy -- or to stay away from a stock that's going nowhere.